Home New Online Ordering from Bear Creek Fudge! New Online Ordering from Bear Creek Fudge! Twice as Nice Tin – pick two of your favorites! Bear Creek Fudge is excited to offer new online ordering for your Christmas and Hanukkah shopping needs. Browse through our delicious current items by clicking on the “Shop” menu link. 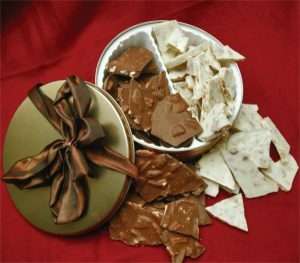 As we know everyone on your list has different chocolate needs, we offer custom gift baskets in addition to the ready made selections pictured on the “Shop” pages. Just pick a few of your favorite items and we can wrap them up with a nice card for delivery to your friends, family or business clients. If we can do anything special to help you, please feel free to call us at the shop during business hours (10 am to 5 pm, Wednesday through Saturday). If you are a night owl shopper, feel free to drop us an email or order online anytime. As always, we look forward to providing you with lots of rich, delicious, divine, melt-in-your-mouth chocolate!